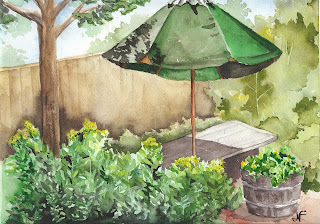 Janice H2O Color: I'm back on track with my weekly plein air painting! I'm back on track with my weekly plein air painting! After the excitement of the SCVWS "Anything Goes" reception last weekend, I'm back to fitting in a plein air session each week. This time I chose an excruciatingly hot day and sat out on my deck, looking across to the corner of the backyard. I simplified the scene somewhat-included the picnic table-omitted the chairs, expanded the shrubs, shrunk the brick terrace, etc. I'm still working on depicting layers of foliage; I tried a couple of techniques here. I'm pleased with the way the umbrella came out-patterns of light and shadow on the various segments were very tricky.